We are potty training this week, so looking for lots of activities to keep us busy that don't require us to put too many clothes on, or stray too far from wee receptacles. 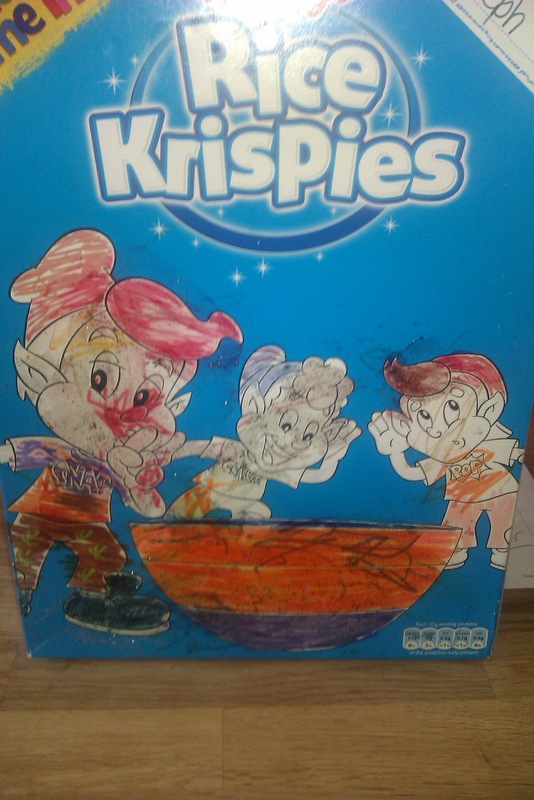 The kind folk at Rice Krispies sent us a huge box of Rice Krispies and some lovely pens and the perennial favourite glitter glue, friend of toddlers everywhere, and nemesis of mums! We lugged said box of Rice Krispies, and the pens over to Luxembourg and Germany, unfortunately our holiday plans went a little awry and we didn't get a chance to work on the box by the banks of the Mosel or the Rhine, so Bury it is! 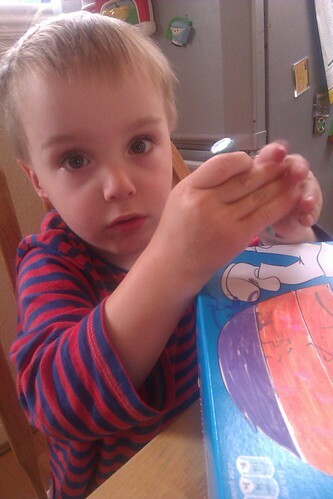 Joseph is just discovering the delights of colouring in, and he and I had an enjoyable hour tackling the box! Staying within the lines is totally optional of course. 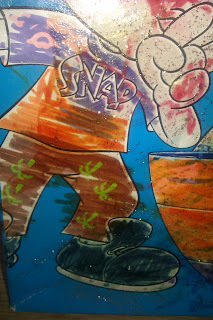 He loved the colour change stamp pens and gave Snap some very groovy holiday trousers. We've been checking out the Rice Krispies recipes, and perhaps we'll do another post about our cooking exploits another day. Just as soon as I've cleaned up the glitter glue fom every kitchen surface! I received a box of Rice Krispies and a pen set for this challenge set by Britmums in conjunction with Kellog's Rice Krispies. Sweet pics-we are in the midst of potty training and nearly there! Good luck with it all. Snap's trousers are pretty awesome, I must say! Lovely colouring by Joseph!